To protect your home and extend the life of your rainwater goods we have a range of leafguard products. We also offer 100% money back guarantee that our COLORSTEEL® Leafscreen will stop birds and rodents getting in via spouting. Don’t risk working at HEIGHTS to clean out your spouting and don’t risk blocked spouting causing often costly WATER DAMAGE to your investment. A louvred metal screen that gives the greatest protection from leaves, keeping 97% of all organic matter out of your spouting this product gives you the ultimate peace of mind. The only Product we install to prevent Birds and Rodents from getting into your roof space and we’re so confident we give a 100% money back guarantee that it will work. Gutter Foam is designed to let the water through and the leaves out, is UV resistant and comes with a 7 year product warranty. Easy to install this is a cost effective solution. Unwanted debris and leaves are unable to enter below the level of the Gutter Foam and their momentum carries them over the edge of the gutters or the wind eventually blows them of. Leaves and debris will not become entrapped within the foam like many of our competitor’s products. The result is that maintenance on your gutters is reduced to almost zero. 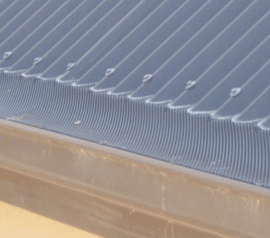 Gutter Foam has minimal maintenance – fine dust particles will eventually find their way through our great product and you will need to do minimal maintenance once in a while; how often will vary with each house and area. High dust areas will require more regular maintenance than others. However we can assure you that no matter where you live your gutter maintenance will be substantially less than what it currently is. Great Barrier leaf gutter guard system is 99% effective at keeping leaves from gutters and 100% effective at keeping birds and other pests from making a home in your roof. Made in Australia, Great Barrier Leaf is a revolutionary product that fits almost all existing gutters. And better still, Great Barrier Leaf is built to last. Installed properly, Great Barrier Leaf will last up to 20 years.